Perhaps the most important tool you’ll use in troubleshooting auto electrical systems is the multimeter, usually digital. 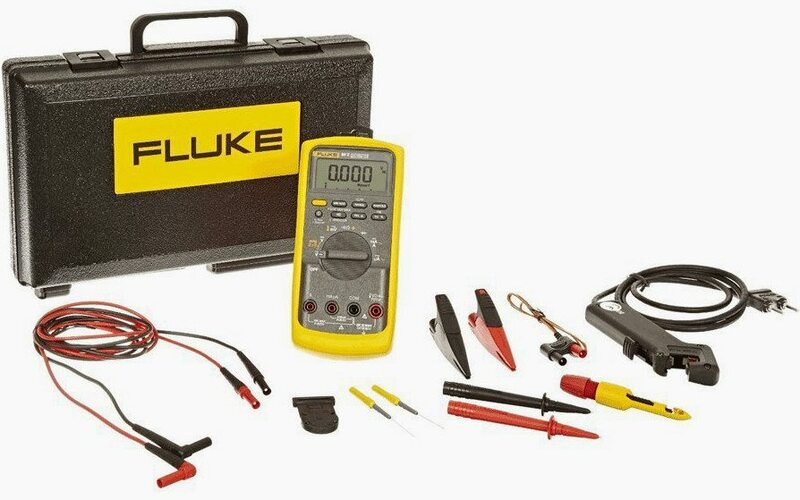 Basic multimeters measures: voltage, current and resistance, while more elaborate multimeters, such as for example the Fluke have features that can check things such as frequency, duty cycle, dwell, make diode tests, and even measure temperature, pressure and vacuum. This technical article is intended as a guide for the professional mechanic. It describes some of the test procedures commonly used by experienced technicians. However, some of the procedures require you to take certain precautions to avoid personal injury and/or damage to equipment or vehicles. Be careful. Charging system problems often come to you as a “no-start” complaint. Many people won’t bring a car into the shop until it won’t start, so for a great many failures that’s the first symptom you’ll see. The battery will have discharged and the starter won’t crank the engine. 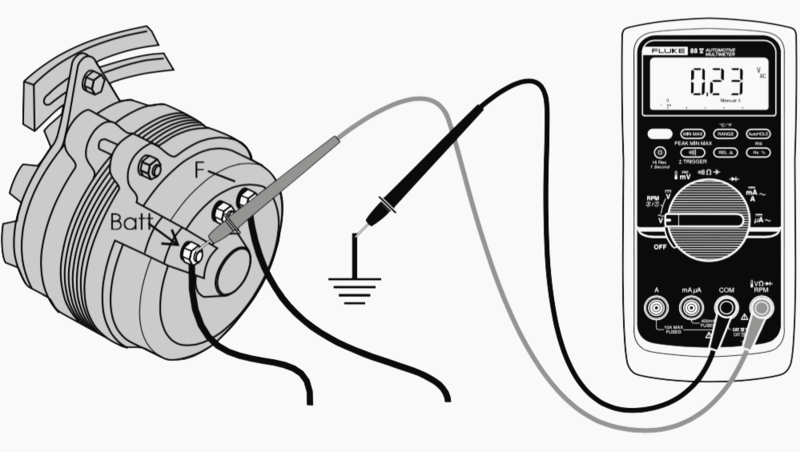 The first step is to test the battery and charge it if necessary (Figure 1). Bleed the surface charge from the battery by turning on the head-lights for a minute. 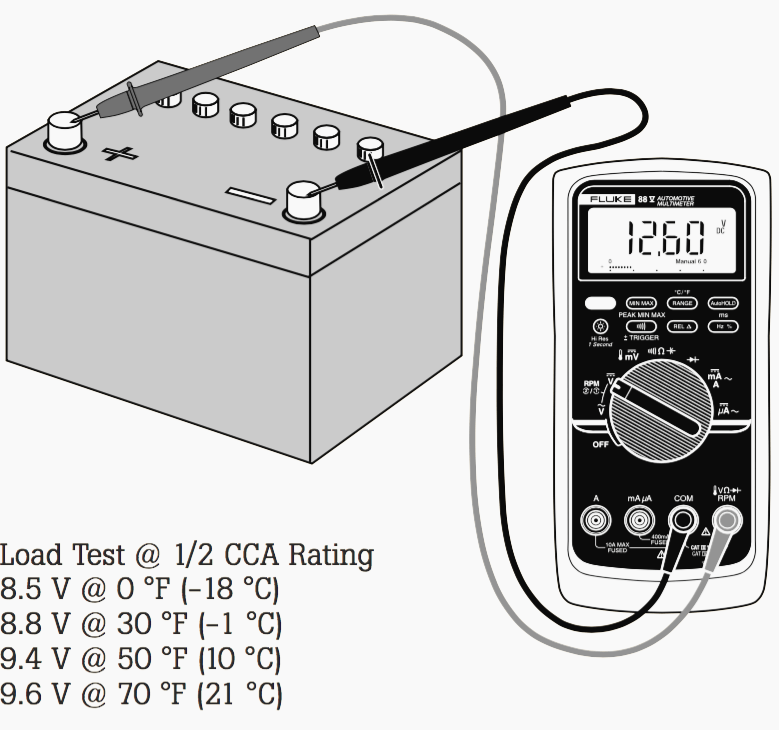 Measure the voltage across the battery terminals with the lights off (see chart ‘Load test at 1/2 CCA rating’). When possible, individual cell specific gravity should be checked with a hydrometer. A load test should be done to indicate battery performance under load. Voltage tests only tell the state of charge, not the battery condition. A digital multimeter’s accuracy and digital display make regulator/alternator diagnosis and adjustment easy. First determine if the system has an integral (internal) regulator, then whether it’s type A or B. Next, isolate the problem to alternator or regulator by bypassing the regulator (full-fielding). Ground Type-A field terminal. Connect Type-B field terminal to Battery +. If the system now charges, the regulator is faulty. Use a rheostat if possible. Otherwise, just idle the engine (lights on) so the voltage doesn’t exceed 15 V.
The battery must be fully charged (see Figure 1). Run the engine and verify that no-load voltage is 13.8-15.3 V (check as in Figure 1). Next, load the alternator to rated output current with a carbon pile across the battery. Run the engine at 2000 RPM. 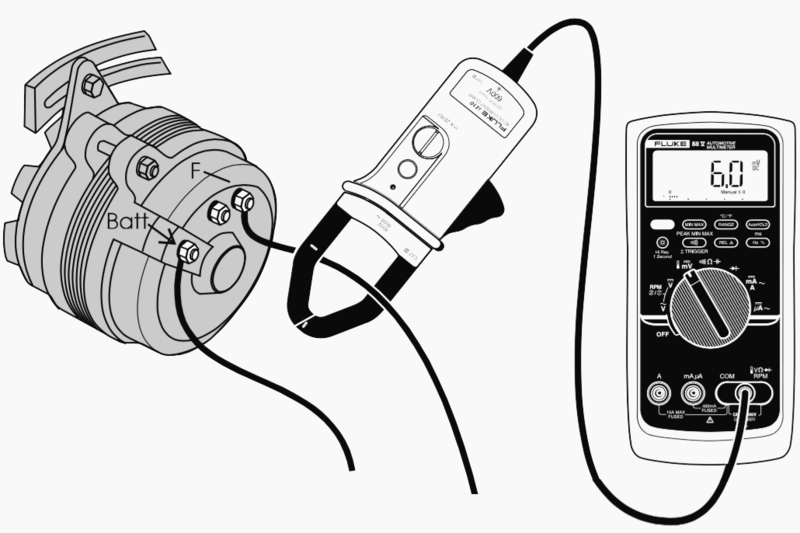 Check the current with Fluke i410 or i1010 current clamp. An alternator generates current and voltage by the principles of electromagnetic induction. Accessories connected to the vehicles charging system require a steady supply of direct current at a relatively steady voltage level. You can’t charge a battery with alternating current, so it must be rectified to direct current. Worn brushes limit field current, causing low alternator output. 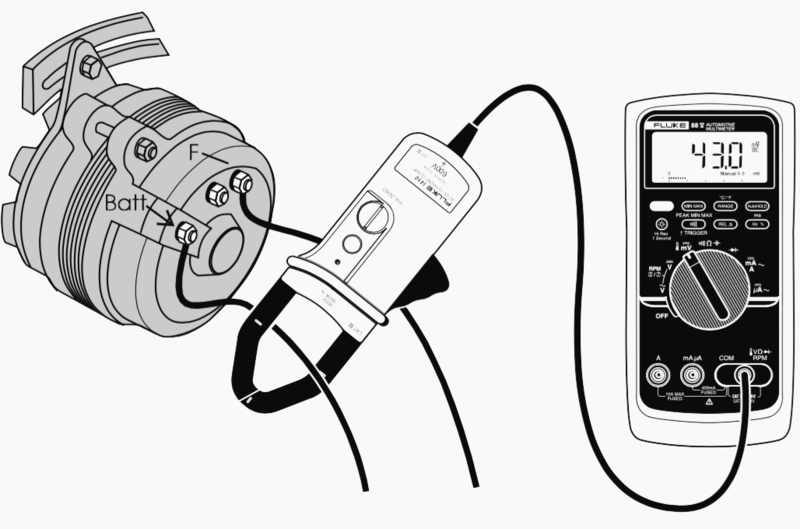 To test: load unit as in Figure 2 and measure field current with current clamp or use 10 A jack on digital multimeter. Readings range from 3 to 7 amps. On integral GM units: with alternator not turning, jump terminals together and connect both to Batt + with digital multimeter in series set to measure 10 amps. Field current should be between 2 and 5 amps, higher current with lower battery voltage. Control battery voltage by loading it with a carbon pile. 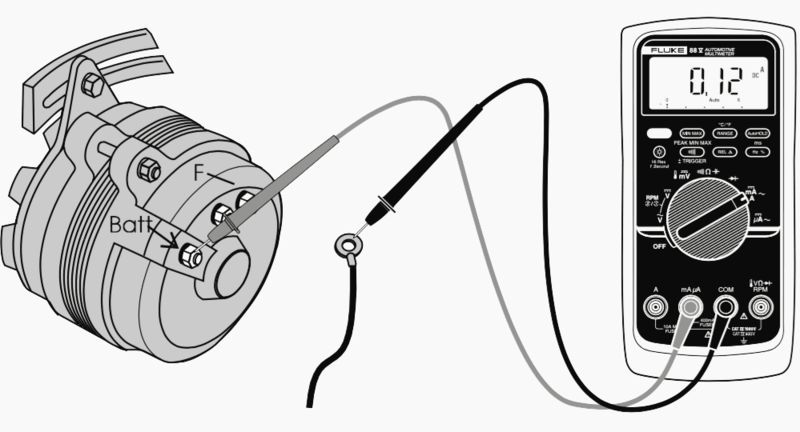 Ripple voltage or (AC voltage) can be measured by switching your digital multimeter to AC and connecting the black lead to a good ground and the red lead to the “BAT” terminal on the back of the alternator, (not at the battery). A good alternator should measure less than .5 V AC with the engine running. A higher reading indicates damaged alternator diodes. 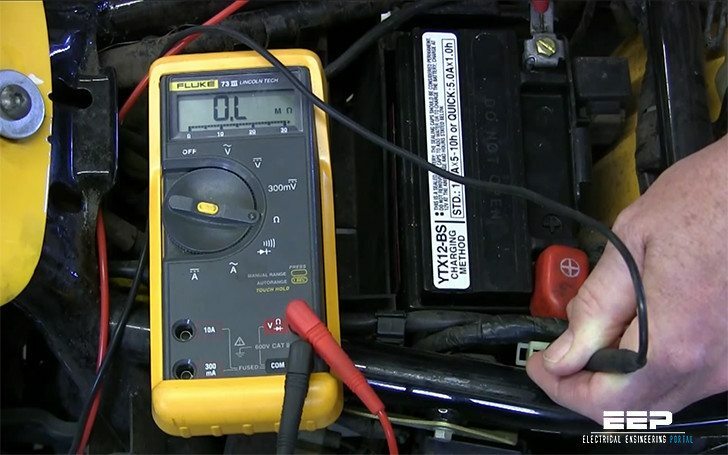 To check alternator diode leakage, connect the multimeter in series with the alternator output terminal when the car is not running. Leakage current should be a couple of milliamps at most. More often, it will be on the order of 0.5 milliamps. Use care when disconnecting the alternator output wire. Make sure the battery is disconnected first. Connect the meter, then reconnect battery. Thanks for the article, really helpful. You’re welcome Mayank, I’m glad you like it.